Mary of Nazareth, a simple Jewish girl, was selected by God to carry out a very special task. It was her mission in life to bring forth a child with the name of Jesus, the Savior of the world (Matthew 1:21; Luke 1:31). She was chosen to deliver the Deliverer. She was a special mother and throughout her life she displayed several characteristics that we can learn from. 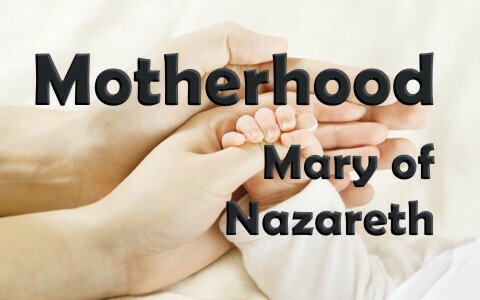 Take a look at what the Bible says about the motherhood of Mary of Nazareth. Mary must have been astounded and even fearful when the angel of the Lord appeared to her to tell her that she was to conceive a son. Not only did the angel tell her that His name would be Jesus, but he told her how great He would be. He would be called the Son of the Highest and inherit the throne of David and He would reign over the house of Jacob forever — His kingdom would have no end (Luke 1:30-33). All this even though Mary had never been with a man. Even so, she submitted to the word of the Lord as announced by the angel. Mary believed what the angel had to say and she rejoiced about it. Though it must have been extremely difficult to comprehend, she knew she was a simple girl, not a girl of means and not from a family of wealth, but one of “low estate”. She humbled herself to this fact. Mary knew that Jesus could provide however much wine they needed at the wedding where this account took place. However, Jesus made it clear that she was overstepping her bounds and that in this instance Jesus was not taking any orders from her. She was just a “woman”, no special powers to control what Jesus did. Matthew 12:46–50 While he yet talked to the people, behold, his mother and his brethren stood without, desiring to speak with him. Then one said unto him, Behold, thy mother and thy brethren stand without, desiring to speak with thee. But he answered and said unto him that told him, Who is my mother? and who are my brethren? And he stretched forth his hand toward his disciples, and said, Behold my mother and my brethren! For whosoever shall do the will of my Father which is in heaven, the same is my brother, and sister, and mother. This is another example of how Mary was not hallowed above any other of Jesus’ followers. In this account Jesus is teaching about the family of God and how that those who follow the will of the Almighty Father are joined as family. Mary was not only Jesus’ earthly mother, but she was His sister in the family of God as well. She was not considered any better than anyone else in the crowd. Luke 11:27–28 And it came to pass, as he spake these things, a certain woman of the company lifted up her voice, and said unto him, Blessed is the womb that bare thee, and the paps which thou hast sucked. But he said, Yea rather, blessed are they that hear the word of God, and keep it. After Jesus told the crowd about a certain man with unclean spirits and how He healed the man by causing the unclean spirits to leave, a woman (who must have thought Jesus to be a prophet) began to speak in honor of Jesus’ mother. Rather than use the opportunity to speak about Mary, Jesus instead taught the importance of hearing the word of God and doing what God desired. Mary was not held as high as the Word. Leviticus 12:6–8 And when the days of her purifying are fulfilled, for a son, or for a daughter, she shall bring a lamb of the first year for a burnt offering, and a young pigeon, or a turtledove, for a sin offering, unto the door of the tabernacle of the congregation, unto the priest: Who shall offer it before the LORD, and make an atonement for her; and she shall be cleansed from the issue of her blood. This is the law for her that hath born a male or a female. And if she be not able to bring a lamb, then she shall bring two turtles, or two young pigeons; the one for the burnt offering, and the other for a sin offering: and the priest shall make an atonement for her, and she shall be clean. Luke 2:22–24 And when the days of her purification according to the law of Moses were accomplished, they brought him to Jerusalem, to present him to the Lord; (As it is written in the law of the Lord, Every male that openeth the womb shall be called holy to the Lord;) And to offer a sacrifice according to that which is said in the law of the Lord, A pair of turtledoves, or two young pigeons. Contrary to what some would believe, Mary was not sinless. She was born a sinner just like every other human. She knew this and admitted it with her own actions when she offered a sin sacrifice. Luke 2:34–35 And Simeon blessed them, and said unto Mary his mother, Behold, this child is set for the fall and rising again of many in Israel; and for a sign which shall be spoken against; (Yea, a sword shall pierce through thy own soul also,) that the thoughts of many hearts may be revealed. Hebrews 4:12–13 For the word of God is quick, and powerful, and sharper than any twoedged sword, piercing even to the dividing asunder of soul and spirit, and of the joints and marrow, and is a discerner of the thoughts and intents of the heart. Neither is there any creature that is not manifest in his sight: but all things are naked and opened unto the eyes of him with whom we have to do. John 19:26–27 When Jesus therefore saw his mother, and the disciple standing by, whom he loved, he saith unto his mother, Woman, behold thy son! Then saith he to the disciple, Behold thy mother! And from that hour that disciple took her unto his own home. Though the Bible does not record much about the relationship between Jesus and His mother Mary, we do see that he honors her in His last moments of life. He was careful to choose His best friend as Mary’s caregiver from that time on. His best friend was also His spiritual brother and so He trusted Him above all others to care for Mary. In His dying moments Jesus gave an example of how important it is to care for our earthly parents. Mary was chosen for a very special mission and it must have been difficult. Even so she was submissive, humble, obedient and dedicated. She was never hailed better than any of the other followers of Jesus but even so Jesus demonstrated his honor for her in his last moments when He made sure to give her over to the care of his dear friend John. Mary’s motherhood was extraordinary but not so much so that we cannot learn and apply her attitudes and traits to our own lives. Think how Mary must feel having so many folks praying to her rather than the Father in Jesus’s Name. We have this great teaching by Jesus Himself to “…ask for anything in my name, and I will do it, so that the Son can bring glory to the Father”(Jn 14:13), yet many like myself were taught and spent thousands of hours in prayer to Mary. God help the church combat the errors taught by godly men. I too was taught to pray to Mary for intercession. I spent many years doing that only to learn (by reading the Bible) that she does not take our prayers to the Father … how could she? I am thankful that Jesus brings glory to Our Father when we ask in His name. Giving glory where glory is due! I attempted to speak the truth in love in this article. Next post: How Can You Honor Parents That Are Hard To Honor?